CENSTECH is dedicated on spare parts for Apple devices. We always do our best to provide the premium high quality and excellent service to every customer. Choose CENSTECH, Choose the best protector for your life! The charging stand dock made of premium aluminum alloy with refined polishing. The anti-scratch rubber and the TPU back protect your device from scratching and sliding. Charging stand holder with silicone anti-skid pad on the bottom to effectively prevent slipping. 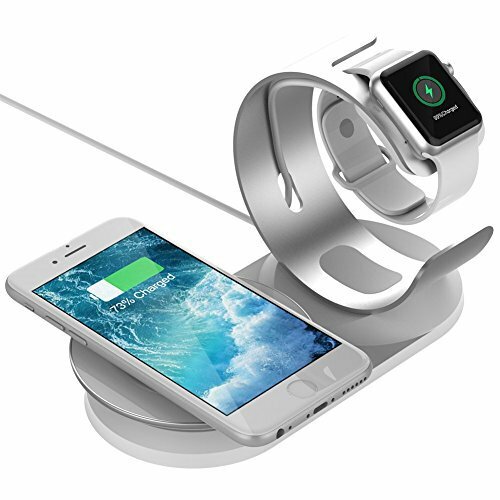 【2 IN 1 WIRELESS CHARGING STAND】 Perfect combination of cellphone wireless charging stand and iWatch charging holder. It is a good management of desktop cleanliness. The elegant stylish design perfectly decorates your bedroom, study, hall, office desk. ATTN: Apple Watch magnetic charger NOT INCLUDED. 【2 CHARGER MODES 】10W Fast Charger Mode ONLY support Samsung Galaxy S9 Plus, S9, Note 8, S8, S8 Plus, S7, S7 Edge, S6 Edge Plus, Note 5 (ATTN: Samsung S9 Plus and S9 OEM AC adapter CANNOT SUPPORT fast wireless charging); 5W STANDARD MODE supports iPhone X, iPhone 8, iPhone 8 Plus, Google Nexus 4/5/6 and other Qi--enabled devices. Please use the most appropriate adapters for best results. Non-Qi enabled phones require to equip a Qi-Enabled Receiver. 【OPTIMIZED SAFETY &CASE FRIENDLY】With overcharge, overcurrent and overvoltage protection, your cellphone are fully protected. Phone cases (THICKNESS within 4MM) are supported. To get better experience, we would like you to take off the phone case and use the original adapters and magnetic cable (NOT INCLUDED). 【iWATCH CHARGING STAND】 Specially designed for iWatch SERIES 3/2/1 (38mm & 42mm), with 50° viewing Angle to support NightStand Mode. Steadily holds your iWatch. 【MATERIAL & GURANTEE】Constructed of premium aluminum alloy with refined polishing and TPU back protect your device from scratching and sliding. We are dedicated to custoerms' 100% satisfaction. If you have any questions, please feel free to conact us first.We will offer you a full refund or resend a new brand replacement. If you have any questions about this product by sincetop, contact us by completing and submitting the form below. If you are looking for a specif part number, please include it with your message.